This professional standard articulated ladder can be used in numerous positions, making it ideal for almost any household, DIY and garden task. Use as a straight or overhang ladder, step ladder or scaffolding before folding neatly after use for tidy storage and travel. The three twin hinges are fully adjustable and lock securely into place ensuring you always have a solid footing beneath you. 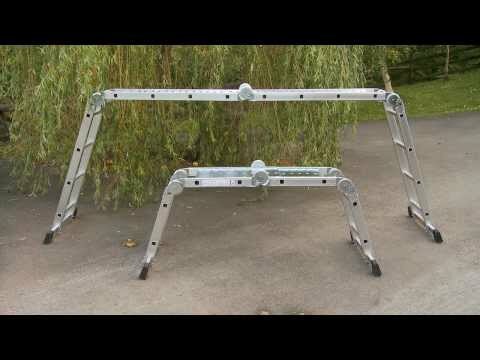 Ideal for decorating awkward stairwells or trimming high hedgerows, it also includes galvanised steel platforms that transform it into a sturdy work platform. Manufactured in heavy gauge aluminium to European quality and safety standard (EN131). Maximum load: 150kg. Available in a choice of three sizes. 4x2 ladder fully extended measures H249 x W37 x D11cm. As an A-frame the ladder measures H122 x W87 x D37cm. As a platform the ladder measures H72 x W160 x D37cm. Folds down to H70 x W37 x D27cm. Weight: 11kg. 4x3 ladder fully extended measures H339 x W34 x D11cm. As an A-frame the ladder measures H165 x W113 x D34cm. As a platform the ladder measures H90 x W223 x D34cm. Folds down to H93 x W34 x D27cm. Weight: 14kg. 4x4 ladder fully extended measures H448 x W34 x D11cm. As an A-frame the ladder measures H217 x W139 x D34cm. As a platform the ladder measures H116 x W292 x D34cm. Folds down to H117 x W34 x D27cm. Weight: 16kg.